How to create an art collaboration with a toddler, even when you don’t intend to! This how to create an art collaboration with a toddler instructional article is brought to you by, “I am always a mothering, even when I am drawing”, “I was only distracted for a zero tenth of a second”, “lighting fast toddler hands” and “how do I salvage this?”. I will start this post off by saying I am a typical creative. Not only do i have multiple project going on and unfinished at any given time, as well as a ton more more running through my head, I am also my worst critic. I also draw in my daughters presence, always, as I keep her full time whilst working from home. And that’s how this story started months ago. I was drawing a cat in impressionist form, or at least I was trying to (I don’t even remember why I was drawing a cat, though as it’s one of my daughters favorite animals it may have been for her benefit) and I wasn’t happy with what I had so far. It just looked wrong rather than an impressionist style cat. At the same time I was sitting with my daughter who was three in our living room. I was a little distracted with everything being that my mind was being pulled in multiple directions (daughter, drawing not going the way it should, other members of family, rest of my surroundings). I put the drawing down on my lap with the pencil resting on top, whilst fielding “can I help you draw the cat?” whilst finding a distraction for my daughter, when the inevitable happened. My daughter evoked one of her super speed toddler powers, grabbed the pencil and “helped” me draw. Within a blink of an eye it was done, I don’t even think I had time to put down the object I had just picked up to distract her with. I’d say I was frustrated or slightly annoyed. But in truth, despite the fact I knew that those pencil scribbles were done with such a heavy hand that no amount of rubbing out would remove the deep trench marks, I really wasn’t. Truthfully I hated it a little less, though it may have been that biased mothers love of everything their child creates (yes sometimes you do just a smidgen of a second feel bad wiping away the artwork your precious angel decorated the walls with whilst seething that they chose that as a canvas and not some of the scrap paper). That all said I still didn’t want to waste the art materials and hours that I had struggled to draw that darn cat. Even more so since I hated it a little less now. I wracked my brain for ideas to salvage it. Frankly trying to rub out the pencil scribbles didn’t appeal as I knew it wouldn’t work all that well, so I decided to incorporate them. And the best idea I could come up with was to keep them as part of the line drawing of the sketch and let them dictate colour placement. An actual improvement. The accidental mummy and me cat drawing collaboration in progress. I am by no means the first, last or only artist to collaborate with their children, on purpose or otherwise. In fact not very long after I had started salvaging this cat drawing by incorporating S’s scribbles, I came across a post on Facebook about the talented illustrator and graphic artist Mica Angela Hendricks who is Busy Mockingbird. Detailing her art collaborations with her own daughter. The more colour I added to our accidental mummy and me cat collaboration, the more I liked it and the more apparent it was that S really did help. So I decided to try and replicate the effect and process again with a new picture and this time I would take photographic evidence of each step by step progress. And it worked. So here for your viewing pleasure is a step by step guide (with pictures) to creating an art collaboration with your toddler, even if you really don’t mean to. Italian Greyhound Sketch in progress. Pencil on paper, early stages. Step three. If all goes well in the first two steps, this step should be where you field the question “Can I help?”. If it’s not forth coming you can always jump the gun and ask them to help. Though I find from experience with my three year old, she finds more passion in things they are not allowed to do. “please eat your favorite mac n cheese?”…. “NO!” “Don’t put that yucky tasting thing in your mouth!”…. ***put’s it in mouth. “No you can’t help with this drawing darling, this is mummies special work just by her , but thank you!”……leads to step four. Step 4. Collaborator (toddler/small child) engages their lightning speed super powers and grabs drawing instrument that you stupidly left in their reach (yes it doesn’t matter that it’s in your lap/hand/up higher than you thought they could reach. Silly, silly you). Collaborator (toddler/small child) re-engages their lighting speed super powers and “helps” you draw. Tiara and converse optional, helping mummy draw an Italian Greyhound. The more scribbles the better. Well as long as you can still see the main drawing underneath. Step 5. The salvaging of the artwork, or more better put colouring in the artwork. This is where you get to have fun with your colour mediums. For this I broke out my oil paint based sharpies. I was careful not to go over S’s scribble lines that I wanted to keep. I chose a select number of main colours for the body of the dogs and cat, and black to go over my line drawing and scribble lines by S.
How good are you at keeping between the lines? This is where you need to revisit your childhood colouring in skills and keep between the lines of both your line drawing and your collaborator’s scribbles. fill in the different areas of your drawing that were created by the scribbles with your choice of main body colours. I alternated between gold and silver, creating a patchwork Art Deco effect. Step 6. Tracing over the lines and scribbles. Very carefully I took a black oil based marker and traced both my line drawing and S’s scribbles that I was keeping. Tracing the lines and scribbles, in black marker. Stage 7. This is the grand finally, erase the messy pencil marks that are leftover and went over, tidy up and missed marks in the marker pens, sit back and admire your finished artwork. The finished collaboration. Our mummy and me Art Deco Italian Greyhound Portrait. And rinse, repeat and create an art collaboration with your toddler…..
Another Italian Greyhound in progress. 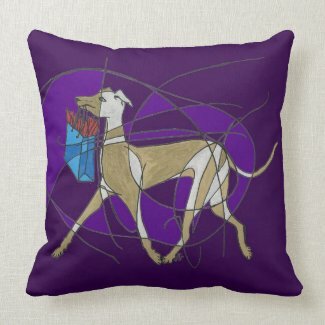 Finished dog on a pillow. S and I are on a roll. Who’s line drawing is better? Mine or S’s? All done with a Deco feel. Now you have read this how-to create an art collaboration with a toddler, do you think you might create some mummy (or daddy) and me art yourself? If you do share your makes on our Facebook page. The link is in the footer our our website. or better yet leave a comment on this post.